New UC Browser 8.8 handler is released! 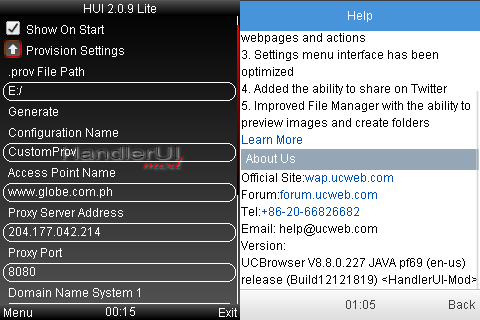 This new UC Browser 8.8 HUI with new handler UI version 2.09 with a lot of features than previous one (thanks to dzebb). One of the main feature is the ability to add custom prov settings with this HUI. It is highly helpful when you are using free Internet tricks. Also another main update is that, downloading speed and support of large files have been improved very much. Previous version had some problems on downloading, which is fixed in this version. They also added new features such as share to twitter, (prior to share on FB) etc. Also, touch screen phone's support also improved much. This is a main updated version of UC, so dont miss it. Download it even before UC team officially declare it! Download speed for large files has been improved. Create customized shortcut keys for webpages and actions. Settings menu interface has been optimized. Added the ability to share on Twitte. Improved File Manager with the ability to preview images and create folders. update: download link is now updated. Enjoy! its still showing " Init:testing network " likewise. what to do next..? Dear its not working,niegther download link nor downloading,we wait for you next kind step/help Admin.